This semi-custom kitchen design included numerous job-site enhancements to create a kitchen packed full of features personalized to the client's requirements. 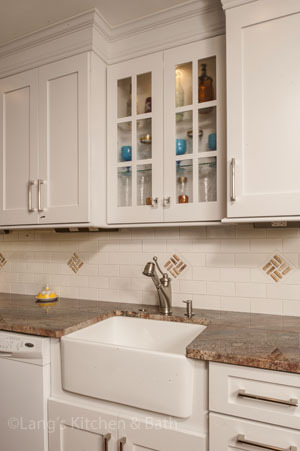 The backsplash is designed with split corks provided by the customer, which were inlaid in the backsplash to provide a personal touch and a focal point in the kitchen design. 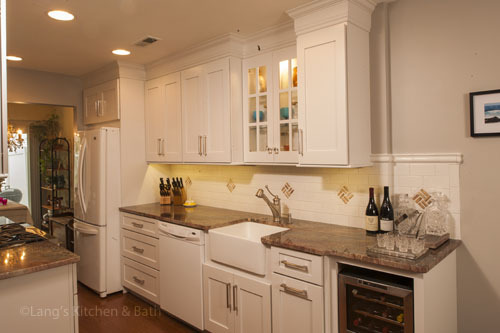 The built-in wine cooler completes the wine connoisseur's ideal kitchen. Additional features of this distinctive kitchen include glass-door cabinets above the sink with interior lights, a farmhouse sink, under-cabinet lighting, hidden angled power strips, and a Viking range.